TaoTao EVO 50 Scooter Moped with 12" Big Tires, Aluminum Rims,100% Street Legal. Free shipping to your door with a free helmet. i year warranty. 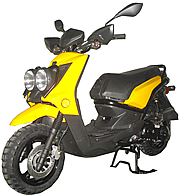 150cc body size; Big bright headlight; Aluminum wheels; Dual shock absorbers! Rear Tires: 120/70 - 12"
Assembly: This Item comes 90% assembled (front tire, front cover, mirrors, rear trunk, battery set up and minor adjustments are required). Be sure to tighten all screws, check for appropriate levels of engine fluid and fully charge battery prior to operation. 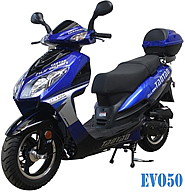 The stylish EVO-50 Motor Scooter is perfect for zipping around town, or for a trip to the beach! It is brought to you by Tao Tao, importer of a large ISO-9001 certified factory with state of the art manufacturing equipment, processes, and quality controls. Close attention is given to maintaining the highest levels of quality. 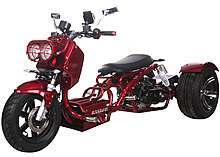 It's 50cc 4-Stroke Engine delivers a top speed of 35 MPH, it can easily keep pace with street traffic! This fashionable vehicle comes with a large matching rear trunk and under-seat storage to carry your necessities, footrests for two passengers. The EVO-50 is sure to be the eye catcher. It is street legal in all States including California. 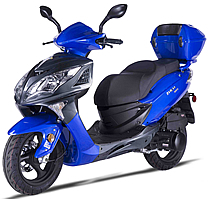 With these latest improvements, it's exceptional power, sporty handling, and fuel efficiency this scooter's value is unmatched. At 70-100 MPG and gas prices are fluctuating, scooters are a great choice for everyone. Whether you're looking for low priced dependable transportation or if you just want to get on a fun ride whenever you feel like to, our scooters are the way to go! 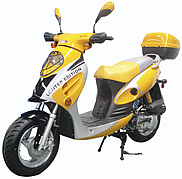 The Front Disc Brake and Fully Automatic CVT Transmission make this scooter both Safer and Easy to drive. The EVO-50 is finished up with a road gripping Dual-Shock Suspension and Performance 12" big DOT tires. 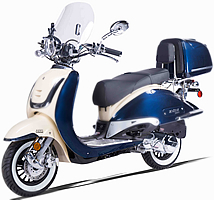 When you purchase this EVO-50 scooter you get a worry-free 12 month warranty. Parts availability is 100%, we honor the warranty with no excuse!